Hello and welcome to my blog. It’s a busy Sunday evening this week as I’m taking part in two Blog Hops tonight. 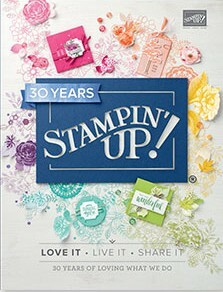 For the first hop I’m hopping with 18 other talented ESAD members from Australia and New Zealand, showcasing Stampin’ Up! Designer Series Paper. You may have hopped over from the very talented Nicole Wilson, thanks for continuing on with me. There’s a Participant List at the end of my post just in case you get lost along the way. 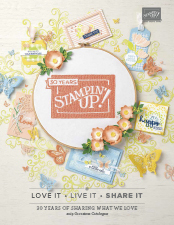 For the month of July Stampin’ Up! has a promotion on their DSP, Buy 3 and get 1 FREE!!! You have a choice of 10 fabulous new DSP’s from the current Annual Catalogue. Included in the promo is Nature’s Poem, Twinkle Twinkle, Under the Mistletoe, Animal Expedition, Best Route, Petal Promenade, Tranquil Textures, Garden Impressions, Tropical Escape and my favourite, Wood Textures. I’ve used two of my favourite DSP’s, Animal Expedition and Wood Textures to create this double easel card. My inspiration comes from Patty Bennett and her Tropical Chic card. I’ve changed her measurements to suit Australian A4 card stock. If you’d like the measurements please send me a message and I’ll email them to you. I’ve layered Animal Expedition DSP over Shaded Spruce card stock. My card base is Grey Granite. One of the many wonderful things about SU products is the co-ordination. Did you know the Animal Friends Thinlits co-ordinate with some of the animals on the DSP? That’s right, you can just die cut them straight from the DSP!!! I’ve used the Stitched Labels Framelits Dies on some Wood Textures DSP then stamped the “Happy Birthday” from the Detailed With Love stamp set on some Whisper White card stock. I’ve cut around my sentiment then adhered it to the back of a Wooden Frames Element. The leaves are die cut from Animal Friends Thinlits in Shaded Spruce and Lemon Lime Twist. Don’t you just love those cute little frogs sitting on a tree branch? I’ve been making a few cards with animals on them lately and Marvi, my assistant, has been keen to help. My poor Kangaroo and leaves didn’t stand a chance lol. Next on tonight’s hop is the lovely Jackie Aitkin, I’m sure you’re going to love her creation. Just click on the next button to hop on over. Thanks for stopping by. Feel free to leave me a comment, I love reading them all. Love your card Peta. I never knew the framelits can cut out the animals from the DSP. Thanks for sharing that. Now Marvi, don’t eat mum’s beautiful card!! I love that fold. I am definitely getting that bundle on my next order! Oh I love this double easel card Peta, I would love the Australian measurements to try one. I am so in love with this DSP and the stamp set, it is just so cute! Love the photos with Marvi, what a character! Ooo my favourite paper and critters and they look so good like this! I’ll have to give the double easel a try. I think it’s especially unusual in this orientation. Such fun! Love that card fold Peta. So perfect with that DSP and the rest of the suite. Millie says she loves the way Marvi adds texture to your creations. She might try that too!